The Yaris feels a tad dated, but reassuringly familiar. 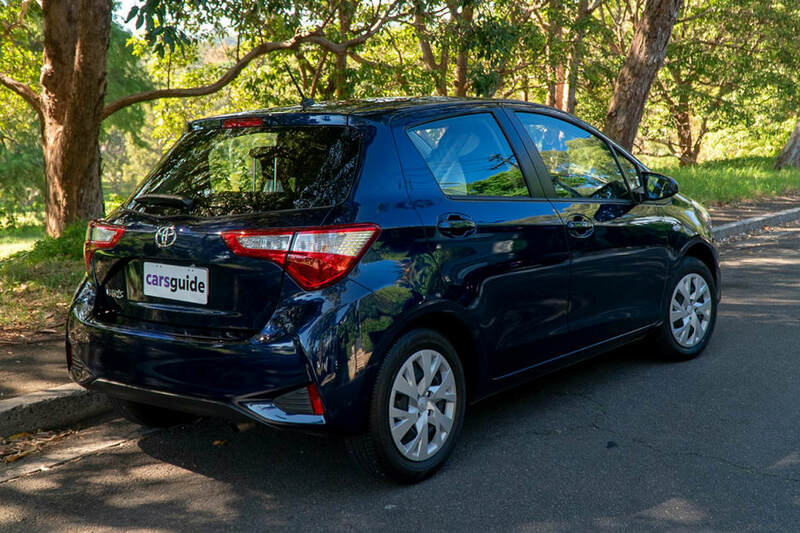 The Toyota Yaris has been a staple on Australian roads for years, but how does this tiddler work as a family vehicle? 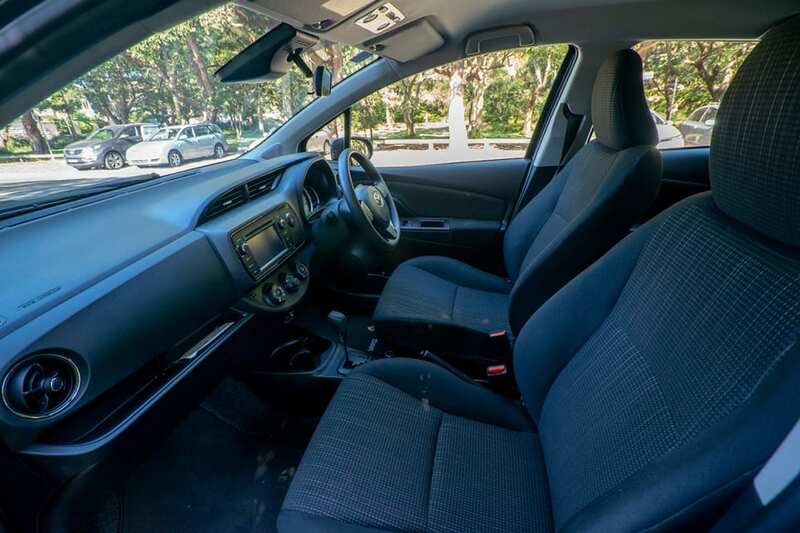 A small car is never the first thing that springs to mind when you're thinking of a family vehicle, but if your budget sits at around the $17,000 mark, this is not a bad option. Families also come in all shapes and sizes these days; your family might be you and one child, in which case a small car would suffice. I test drove the Yaris Ascent with an automatic transmission, which is the bottom of the range. Here's how it fit in with me and my family over seven days of driving. If you think the Yaris looks like it hasn't changed shape in about a decade, you'd be right. Almost. It's been eight years since it's had a makeover. There's something comfortingly familiar about it on first sight, like when you find an old T-shirt that's well past its use-by date. It's comfy, but you wouldn't really go out in public with it. That's how the Yaris feels, a tad dated, but reassuringly familiar. If you think the Yaris looks like it hasn't changed shape in about a decade, you'd be right. There's something comfortingly familiar about it on first sight. It's been eight years since it's had a makeover. The inside is where this car could really do with a makeover, however. 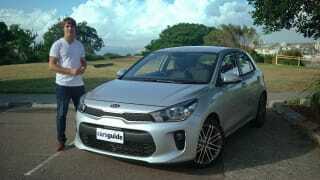 While it's in a budget category, there are other, more stylish cars in the same price bracket that do a better job like the Mazda 2 and Kia Picanto. 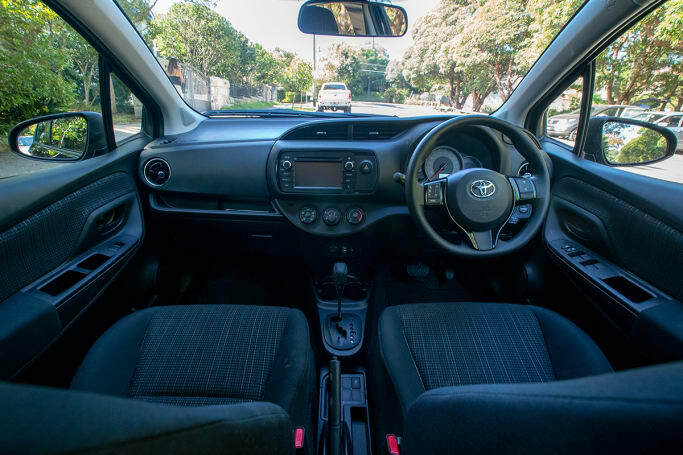 The Yaris is full of hard plastic bits on the dash and doors, the centre console is basic in design and there are no standout features or recent efforts to lift the interior. The fabric seats are comfortable enough and you do have to remember that we're in an affordable car, so it's never going to be luxurious. But there are other affordable options that have more modern interior designs. I was pleasantly surprised by the space inside the Yaris. Both my taller husband and I had enough room in the front, although he did have to compromise by moving his seat forward so he didn't squash the children's legs. I was pleasantly surprised by the space inside the Yaris. The boot will fit the CarsGuide pram up on its side. The boot is pretty good for a small car at 286 litres. We had a good amount of head space and also enough room between the two front seats, I didn't feel cramped or too close together. The kids also had enough room in the back and I was also perfectly fine, I'm 161cm and could fit easily, with about 15cm to spare between me and my driving position in the front. Larger adults and taller teenagers might be tiny a bit cramped. We didn't have loads of room and because my family is still young, we made do, but it's not the size you would want to be fitting four people into every day. My children were glad to see the back of it, to be honest. The boot is pretty good for a small car. 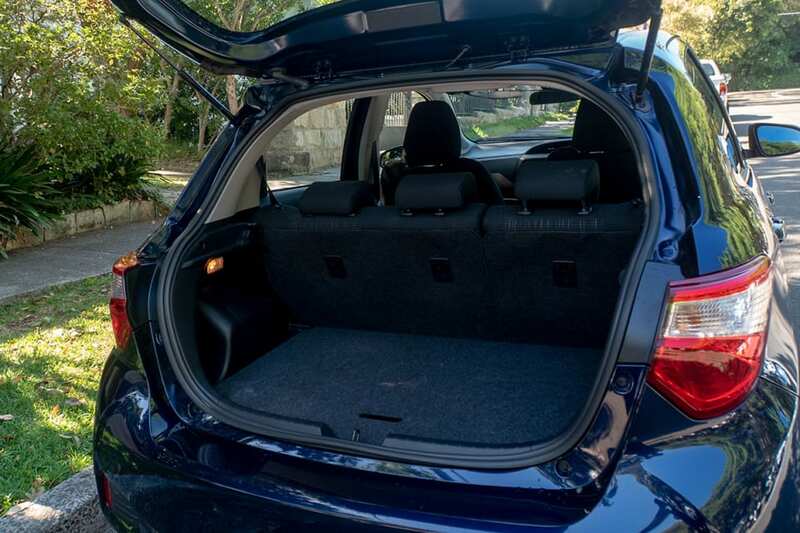 At 286 litres it will fit the CarsGuide pram up on its side (with the cargo cover removed), which is pretty good going, as that pram won't fit in a Hyundai Kona or a Mazda CX-3. Without a pram, you'll easily get groceries or school bags in there. 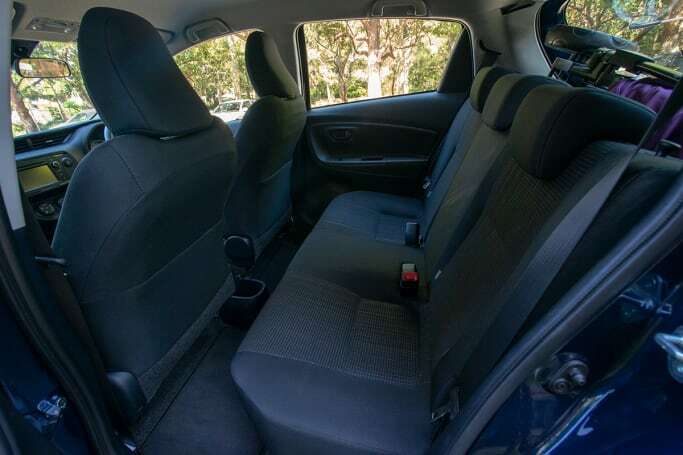 The Yaris Ascent has all the basics covered, like two cupholders in the front, one in the back. A storage spot to throw keys and a phone and bottle holders in the two front doors, plus your usual glove box. It was enough for me for the week. My children were able to climb in themselves and do their own seatbelts up. Bending down to do kids' seatbelts up may get a bit tiresome, especially if you have a baby in a capsule and you're in a constant in-out situation. My children, aged five and seven, were able to climb in themselves and do their own seatbelts up. It is truly one of the joys of your kids getting older when you reach that stage. 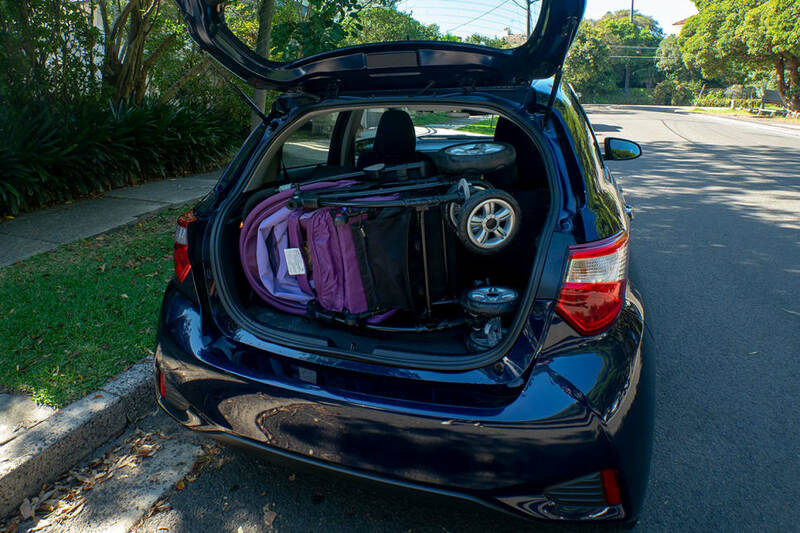 The Yaris will get you from A to B without any fanfare, or too much excitement. There's a hard-working 1.3-litre engine under the cute bonnet, which means it's quite slow going up hills, and on takeoff from a stationary position. When you do press hard on the accelerator, the engine is loud, which makes it sound like the car is making a lot of effort to go a little bit faster. It's not a powertrain that instills confidence, put it that way. There's a hard-working 1.3-litre engine under the bonnet. The gear shifter is long and thin, exactly like a stick, which makes it feel a bit awkward to change gears. The shifter is something I barely notice in other cars, so it really stood out. 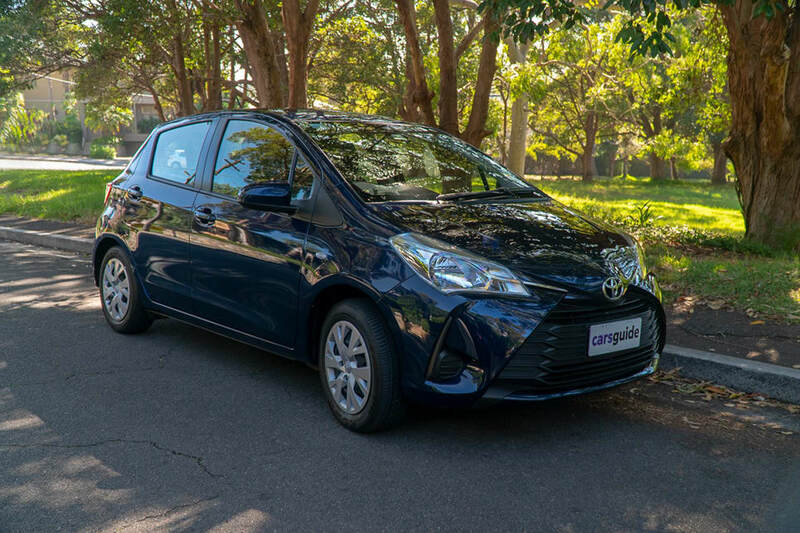 The Yaris's diminutive size means you can easily nip into parking spaces, the steering wheel turns easily and feels even, and there is a reversing camera to help you out. I also found myself doing more u-turns this week than three-point-turns, just because it was so easy, and that always made a difference to my day. 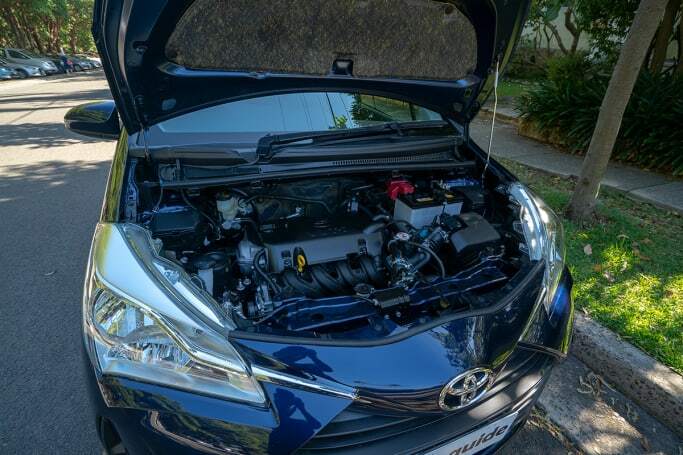 The Yaris Ascent I drove was fitted with the Toyota Safety Sense pack, so for an extra $650 you get newer safety equipment like auto emergency braking, lane-departure alerts and automatic high beam. As standard you'll get seven airbags, plus two ISOFIX points and three top-tether points to fit kids' car seats safely. Toyota relies on its own multimedia system and in the Yaris Ascent model that doesn't include a Sat Nav on the 6.1-inch multimedia screen. You do get one in the top grade Yaris, though. You can connect your phone via Bluetooth, which allows you to make calls and listen to music, and the sound isn't bad on the audio - meaning you can turn it up loud without any distortion. You'll get a 6.1-inch multimedia screen. There's no Apple Carplay or Android Auto, however, which is becoming more standard across the category, so it is lacking on the technology front. The Toyota Yaris Ascent with Toyota Safety Sense ($650) and a premium paint job ($409), comes in at $18,020. Fuel consumption is a fairly average 5.8L/100kms. It comes with Toyota's three year/100,000km warranty, which is shorter than other companies but it seems to work for Toyota, given its reliable reputation. While this is a small car, it still had enough space on the inside to fit a family of four, but the family wasn't overly excited about getting in there for long periods, so as your main car, it might not be ideal for a family (although it would work perfectly for young, single types) but it could work as a second car, with only occasional ferrying duties. 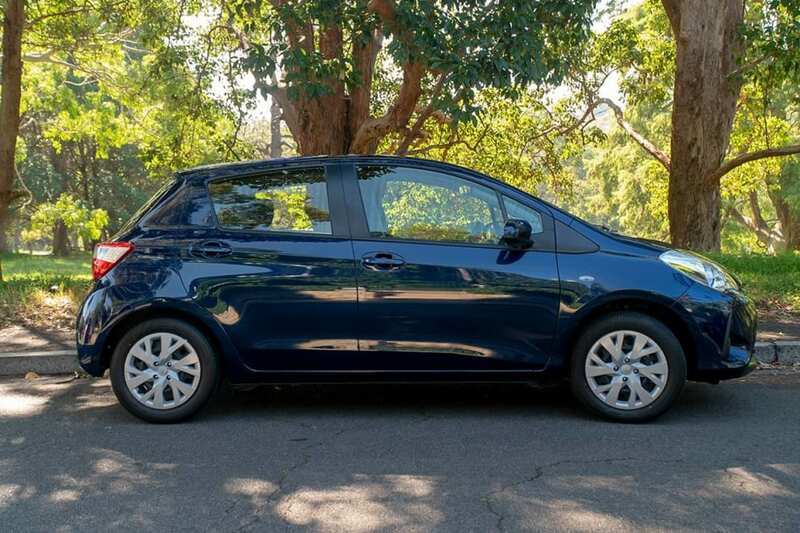 It's a pretty basic model, but if this is your price range then there's nothing exactly wrong with a Yaris, there's just nothing particularly standout about it, either. It will get you from A to B without much fuss and if it fits your needs, then that's great. For me, personally, it wasn't a great fit, literally, because there was no extra space to fit anything else for a family. I also thought it could do with a revamp, as there are competitors in this price range with newer and more attractive designs. I gave it a family rating of 6/10, and my children also gave it a six, because they really don't love small cars. Over four generations, the Rio has well and truly cemented its place when it comes to small cars in Australia. But does the updated and reloaded car for 2019 still deserve that place? 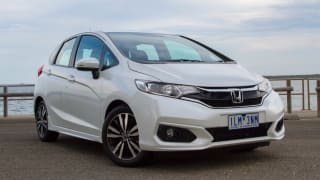 Honda gave its Jazz range a little tweak in late 2017 to hand us the MY18 Honda Jazz. 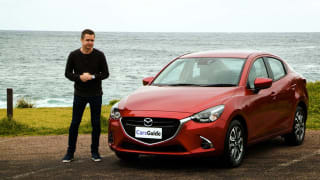 Some features were lost, and a few gained in an effort to keep up with the very fine Mazda2.